May 20, 2016 – It’s History in Five Friday, presented by Simon & Schuster. Today, journalist Lynn Sherr turns our time machine into a rocket ship to shatter the glass ceiling. 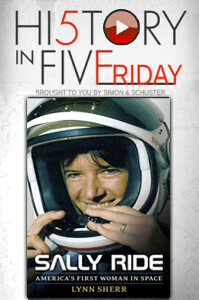 Her new book is Sally Ride: America’s First Woman in Space . You can enjoy our full interview here. It’s the remarkable story of humanity’s first baby steps beyond earth with Sputnik, to the Space Shuttle and I.S.S. You can follow today’s author on Twitter @LynnSherr. Triumph, tragedy, and the right stuff. It’s all up there in the stars.